If you're starting a new business, hiring on a shoestring budget, or simply sprucing up your home office, you'll need some new office gear, and you probably won't want to spend much. Believe it or not, Craigslist isn't just for used couches and one-night stands; it's also exceptionally good for finding standard office furniture (cubicles, desks, chairs, and so on) at unusually low prices. However, Craigslisting is an art in itself, so we've got some tricks that will help you seal the deal on whatever used gear your new office needs. Buying a basic, no-frills office chair and desk at OfficeMax will run you at least $170, a phone/fax machine will cost another $60, and brand-new cubicle units may be tagged at anything from $500 to $3000 apiece, depending on configuration, wall height, and filing options. 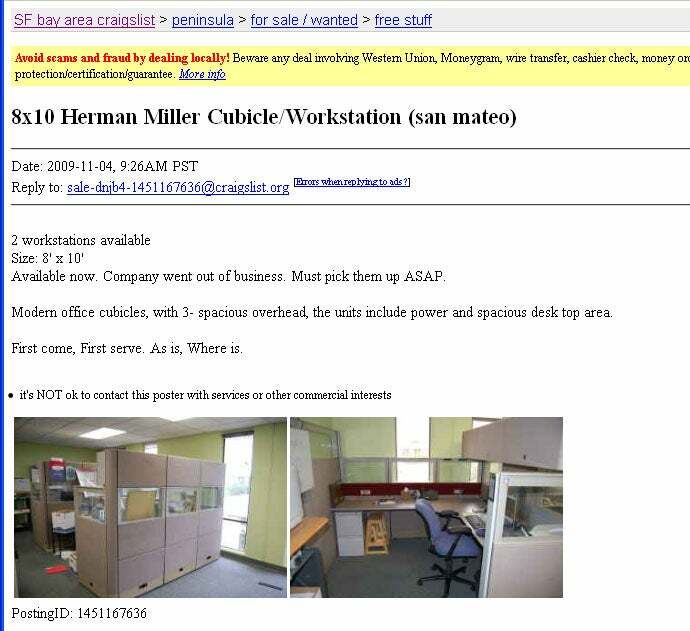 Spend a few minutes on Craigslist, however, and you'll find plenty of office furniture that sellers need to get rid of for cheap--or even free. Free cubicles--if you get them first. The trade-off is your time. Though you could find a chair, a desk, a fax machine, and even some cubicles in Craigslist's 'Free Stuff' section, you have to be fast to pick up, because in many instances the stuff is simply left out on the street for the vultures (that's you) to pick over. We'll help you streamline your search process and seal the deal, but be aware that bargain hunting on Craigslist can be a time-consuming process--and you might be better off investing that time elsewhere in your business. When budgeting for your Craigslist searches, figure time into the calculation: If you end up spending an extra 3 hours to save $20, you might have been better off buying the furniture at full price in the first place. In short: The goal is to get on Craigslist, get the deal, and get on with your workday. Let's start with searching. Unless you have all the time in the world, you shouldn't begin by aimlessly browsing the 'For Sale' sections; instead, zero in on the relevant categories ('Furniture', 'Business', and 'Free Stuff' are sensible choices) and then start searching. 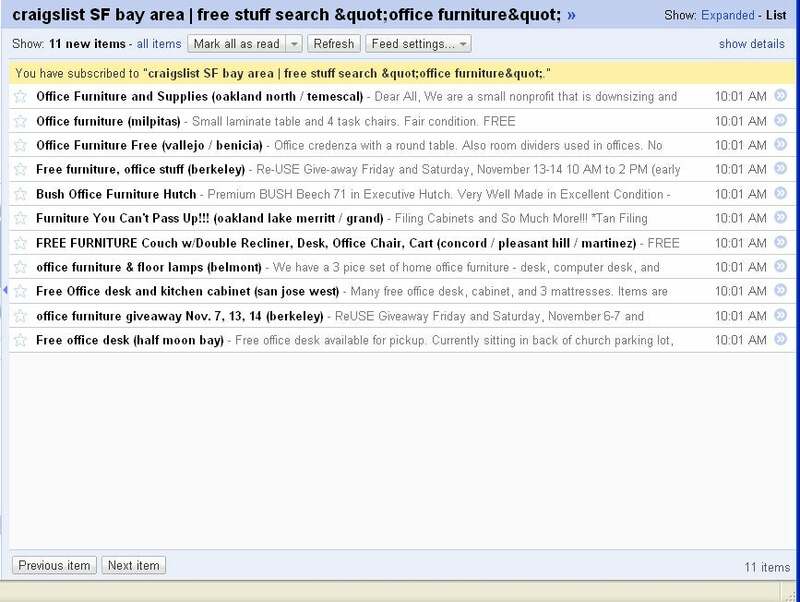 Try entering a general query ("office furniture") in 'Free Stuff' just to see what's available at the lowest price of all. If nothing comes up, move on to 'Furniture' and 'Business'. In those three categories in the San Francisco Bay Area, I got 600 results for "office furniture," so I decided to pare down the search results by checking the 'has image' tag; I figured that if the seller couldn't be bothered to post an image, I probably wouldn't want the item anyway. I also set the minimum price to $2 because I didn't want to see ads from furniture dealers submit their listings with a tagged price of $1 but don't actually list any prices in the ad. Generally speaking, furniture dealers charge higher prices than furniture owners do--you can check them out for yourself in the 'Furniture by Owner' and 'Furniture by Dealer' categories. Track your searches via RSS. If your needs are more specific--a set of filing (or "file") cabinets, for example, or a receptionist's desk--the search process is substantially easier. Start by narrowing the search results with your price range (and desired location, if applicable) and then scroll through the search results. As the "filing cabinet"/"file cabinet" example suggests, it's a good idea to conduct separate searches for alternative terms for the same item if both names are common. A search for "filing cabinet" produced 15 results, while a search for "file cabinet" generated 31 matches, with only four entries repeated from the "filing cabinet" list. (A search for "file filing cabinet" returned only those four overlapping entries.) Craigslist allows you to specify a search as the source for an RSS feed (more on that here), so just click the big yellow RSS button and add it to your reader of choice to stay current without actively prowling Craigslist every 10 minutes. On the other hand, services like Craiglook and Search Tempest offer alternative Craigslist search functions that cater to power users, like slightly more refined search options (search terms to exclude, for example) and the option to search other nearby Craigslist portals. If you live in the San Francisco Bay Area and are willing to drive 250 miles, for example, Search Tempest will include Craigslist search results for the region stretching from Stockton to Sacramento.